Best At Home Teeth Whitening + Giveaway! Okay so I've been through some drama with my teeth. I was hit in the mouth with a baseball bat a few years ago, and my tooth went through my lip. I had to get stitches, and keep an eye on that tooth in the next coming years to make sure nothing happened to it. But alas, the nerve died in my tooth, forcing me to get a root canal. Before the root canal, the dentist discovered a horizontal crack at the top of my tooth that we never noticed before. He told me after the root canal, the tooth would be much weaker, and is very likely it could break over time. I had no choice but to cap the tooth, unfortunately. Before I got a fake tooth put in my mouth that would never change in color or position (like, ever), I wanted to get my teeth whitened. I made an appointment and got whitened with Boost at my dentist's office. When I left and looked at my teeth, I felt like I looked exactly the same. It seemed like my teeth maybe got half of a shade lighter, which was definitely not worth the $300 to get it done. Needless to say, I was pissed. 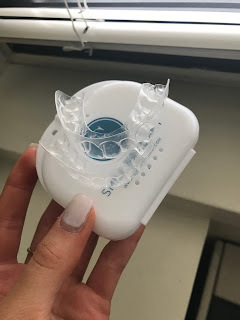 I also knew I didn't want to buy Crest White Strips because I've used them in the past, and felt like they did nothing but give me zingers, which are super painful! BUT! I have a silver lining to this whole story: Smile Brilliant, my teeth whitening solution! So what is Smile Brilliant? They are a teeth whitening company who has come up with a system that whitens your teeth in a safe and effective way. This company produces your own custom fitted teeth whitening trays. Why is this so much better than any other teeth whitening kit? Because these trays ensure that every angle and side of your tooth is covered when whitening, maximizing your results. Sounds too good to be true, right? Wrong! It is true! I took both photos in semi different lighting, but it was both natural light (taken in front of the window.) I did not edit either photo, this product just brought amazing results! I couldn't be happier with how they turned out. How does it work, you ask? Allow me to break it down. 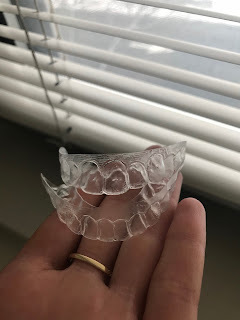 When you receive your whitening system in the mail, you first have to take a molding of your teeth. This may sound like it'd be hard, but trust me if I could figure it out, so can you. You mix the catalyst and base putty together, until is turns a solid light blue color. Then you put the mixture in the dark blue impression trays, and press your teeth far enough into them so they evenly cover every tooth, and goes onto the gums. Standing in front of the mirror while doing so helps a lot! Hold it there for two minutes so it hardens. When it's time, remove trays and don't be afraid to remove them! As long as it's dry, it will stay together in the tray. Repeat for the opposite side, then you ship them in an envelope with an information card that Smile Brilliant provides you! Easy. Once you get your impressions, you're ready to begin whitening! Brush your teeth with only water to take anything off of the surface of your teeth. Take the Teeth Whitening Gel syringe and put a thin line into each tray. Dry your teeth as best as you can, and put the trays in. I like to whiten for an hour because my teeth are a little bit more sensitive, but the whitening time frame is flexible. After whitening, take out the trays and rinse them with water. Fully dry, then put a thin line of The Desensitizing Gel into your trays. Wipe the whitening gel off of your teeth, and dry them again. Then put your trays in for another 20 minutes or so to aid in making your teeth a little less sensitive. Trust me, this is a game-changer. After, take out and rinse again with water. Leave a little bit of the desensitizing gel on our teeth so it continues to help even after you're done whitening, and it's as simple as that! It's also best to whiten right before bed so you don't eat or drink anything right after whitening. Continue the whitening process for your desired time period- however many weeks or months you want. Take photos along the way to keep track of your progress, because there will be plenty of it! Before I go..... it's time for a giveaway! Woo! Click this link and submit your name and email. The winner will be selected and contacted via email in 2 weeks. This giveaway is for a $149 credit and is open to USA, UK, Canada and Australia! Cool, right?! Good luck you guys! This amazing kit could be yours in the next two weeks!